Yay! I love that dress! I think it will look great on you! I vote to line it. You’ll be happier in the end that you spent the extra time. Have your seen this (http://www.threadsmagazine.com/item/4971/a-shortcut-to-great-linings) Threads article? It uses the facings that the pattern comes with, but integrates a lining in a simple way. Super method! I would incorporate the pleats into the lining as pleats. You may want the ease that they will give you, but you could tissue fit both ways and see what you prefer. 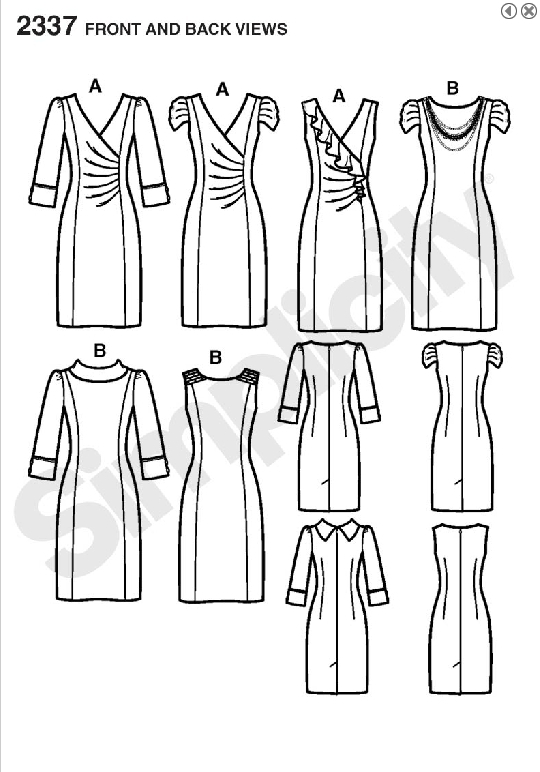 I would use the center front pattern piece for view B, and modify the neckline to match view A. Use the Threads method for Facing A/lining B hybrid, but have an interior that is less bulky and more slip-like. This looks great and congrats on making your decision. For swapping out sleeve, I believe the SOP is to swap out the armscye, too. I usually attach a lining to the facing. In this case, it might be difficult to find a lining fabric which matches the slight stretch of the double knit. As far as the lining pattern is concerned, does this pattern have a full piece for the under-side of the surplice front? If so, that would be the center front panel minus those pleats. You could use that for pattern piece for the lining. I would use the View B centre front for the lining panel, and I would definitely use fused facings. I attach the lining to the lower edge of the facing, I think you get a better result. This is easy – it is just a matter of cutting off the facing portion on the lining, but leaving on twice the seam allowance so you can attach the lining and facing together. Facings never flip out if you understitch, and mainly if you make them wide enough. Never less than 2″ finished size, which is wider than any big4 patterns, and thanks again to Sandra Betzina for prescribing 6″ in mid-back, I’ve never had a problem since. I was thinking about your pattern choices when I saw a doubleknit dress in a store today. It was exactly like this Vogue 8685 pattern! Can’t wait to see yours made up. I second what Marie-Christine said about facings. Go that route. Like soundstitches said, Project Runway patterns are kind of nutty. Their instructions are easy, as long as you know to keep track of the which view you are sewing with which “designer’s additions”. I also agree with Bernadette as far as what to do with lining. The PR patterns that I have used haven’t been lined either, so I feel your pain 🙂 Good luck with your muslin! Good choice – it will suit you nicely. I say line but I know understitching is also an option. Do you want to wear the dress for 5 years or don’t you care about length of wear? Lining will make it hold up better, imao.